Cast : Harrison Ford, Karen Allen, Paul Freeman, John Rhys-Davies, Denholm Elliot, Ronald Lacey, Wolf Kahler, Alfred Molina, Vic Tablian. Synopsis: An archaeologist named Indiana Jones is sent on an expedition to recover the lost Ark of The Covenant by the US Government, to ensure the Nazi’s do not get their hands on what is seemingly a weapon of unimaginable power. Along the way, Indiana rekindles an old flame, battles against snakes and moving vehicles, and even manages to witness the full fury of God. Review : Awesome, spectacular adventure film with Spielberg, Ford, et al in full flight. Raiders is among the most popular films of all time, and remains so to this day due to it’s sense of optimism and escapist fun. Thank goodness Indiana Jones was invented. Dazzlingly, exciting, fun adventure yarn from director Steven Spielberg only gets better with time. Harrison Ford is pitch perfect as the archaeologist adventurer Indiana Jones, a man whose life’s work is dedicated to the recovery of rare, important, and seemingly lost artefacts from across the globe. 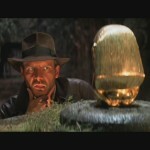 Spawning several sequels (including the most recent, The Kingdom of The Crystal Skull), Raiders of The Lost Ark cemented Ford as a major box-office draw, Spielberg as a director of blockbuster films, and George Lucas as a producer to be feared throughout the industry. The stuff at Harrods was getting decidedly weird. The history of Raiders is well known among cinephiles. After all, Tom Selleck, himself quite famous at the time for Magnum PI, famously turned down the role to star in that TV show, and look where he is now. There’s a special place among film buff’s for Raiders, given its parentage and lineage in film lore. White-hot George Lucas (fresh from Star Wars and Empire Strikes Back) teamed with mega-director Spielberg (fresh from Jaws and Close Encounters Of The Third Kind) to create a film that paid homage to the kind both men enjoyed whist growing up; the pulp, serialised cinema format famous for its incredible stunts, effects and pulpish storylines. Bad Guys were really bad, Good Guys always got the Girl, and there were always the typical misunderstandings and plot pratfalls that got in the way of it being a simply straightforward adventure. With Raiders, Spielberg revolutionized the film industry with his epic, wide-screen action, mysterious and wondrous mythos, and hints at an as-yet unknown world, waiting to be discovered. Indiana Jones quickly became part of cinema folklore, his trademark hat and whip soon entering into the pop-culture subconsciousness. Look, I TOLD you we shouldv’e taken that left at the roundabout! 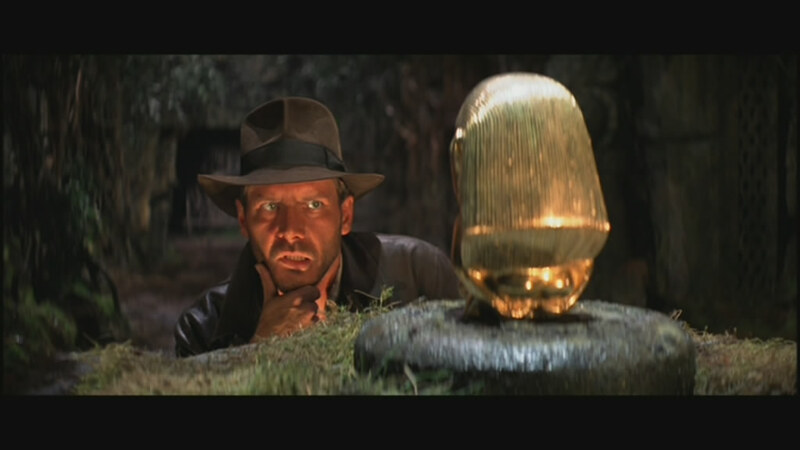 Indiana Jones (Harrison Ford) is an explorer, working for an American university obtaining rare antiquities, something for which he has an affinity. 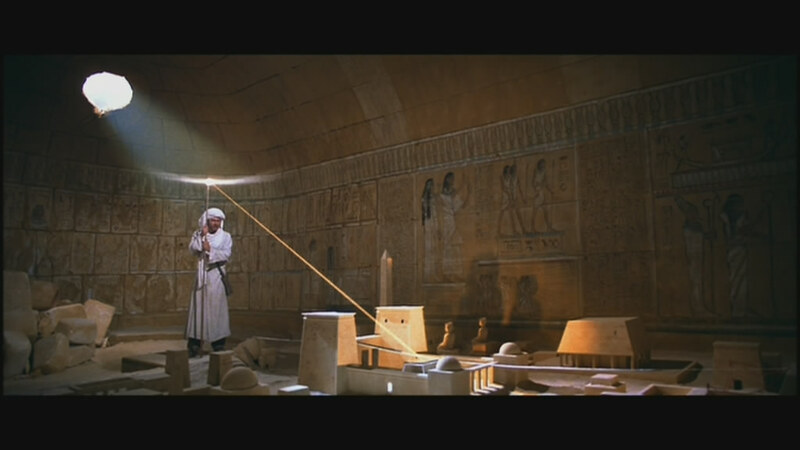 His “real” job involves teaching archaeology to students, although when he is sequestered to obtain the lost Ark Of The Covenant by some agents of the US government, Indy quickly realizes he wont be teaching for a while. The Ark, it is told, is the device used by the Hebrews to transport the remnants of the Ten Commandments around the land, and it is among the most holy and revered artefacts sought from the time of Christ. 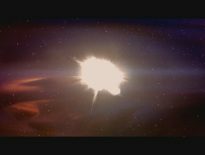 It is thought by Indy and his professor friend, Marcus (Denholm Elliot) that the Ark is quite a powerful weapon, should it fall into the wrong hands. And it might, with Nazi Germany looking for it in the sands of Egypt outside Cairo. It’s 1936, before the War, and Indy is asked to locate and retrieve the Ark from wherever it may be before the Nazi’s do, since the US government doesn’t want an emerging superpower to obtain such a devastating weapon, should such a thing exist. The problem is, Indy has to locate a special amulet from an old flame before he can locate the whereabouts of the Arks final resting place (supposedly). Marion Ravenwood, played with delightful feistyness by Karen Allen, is not the type of girl to suffer fools gladly, and after a Nepalese bar brawl in which both her and Indy despatch several Nazi goons, they both take off for Egypt to look for the Ark. Geez man, did you forget your deoderant today? 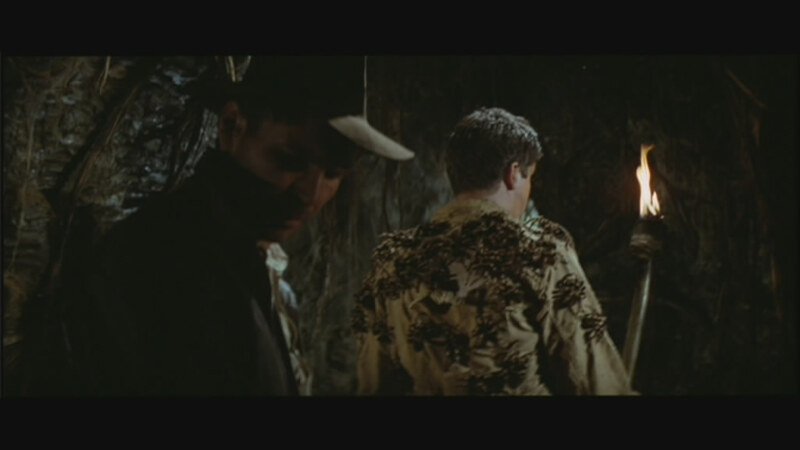 Of course, the plot twists and turns around the various adventures Indy and Marion, as well as friend Sallah (Rhys-Davies) have in and around Egypt, and Indy’s arch-nemesis, Belloq, is played with panache and style by a wonderful Paul Freeman. He’s the French archaeologist working in competition to Indy, and thus, they have their differences. Special mention of a rat-like performance by Wolf Kahler, as Nazi Colonel Deitrich, who is perhaps Spielberg’s greatest villain to date. Kahler’s sense of menace, with his snivelling, slimy delivery, is simply brilliant, making the viewers’ skin crawl almost every time he’s on screen. As he turned, the tune to “I Shot the Sherriff” went through his mind. The entire cast appear to be having a ball, and the role fit’s leading man Ford like a glove. His delivery and sardonic persona completely inhabits the Indy character, allowing him to be a well developed, rounded character we care for, rather than a blustering fool or pompous git with no dramatic weight. There’s even comedy to be had in his one tender moment with Allen, whilst she is trying to soothe his injured body when they’re sailing on a boat. Marion kisses a different part of Indy’s face whenever he points to a part that doesn’t hurt, and when he touches his lips, she leans in and kisses him. And he falls asleep. May seem simple and hardly worth writing about, but the moment is perfectly acted by both Allen and Ford. 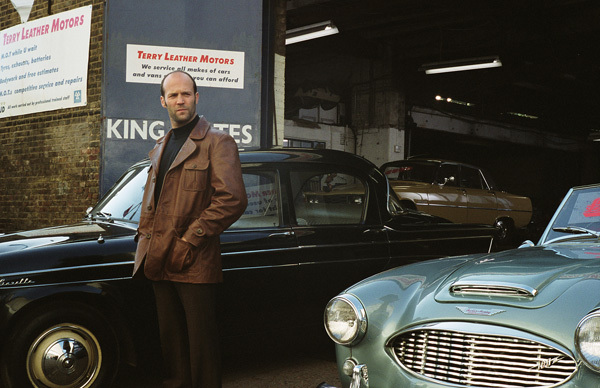 The sly humour that Ford injects into the role has made the film a genuine classic. Tell me my dear, have you ever met a man with lips like mine?? Well, have you??? 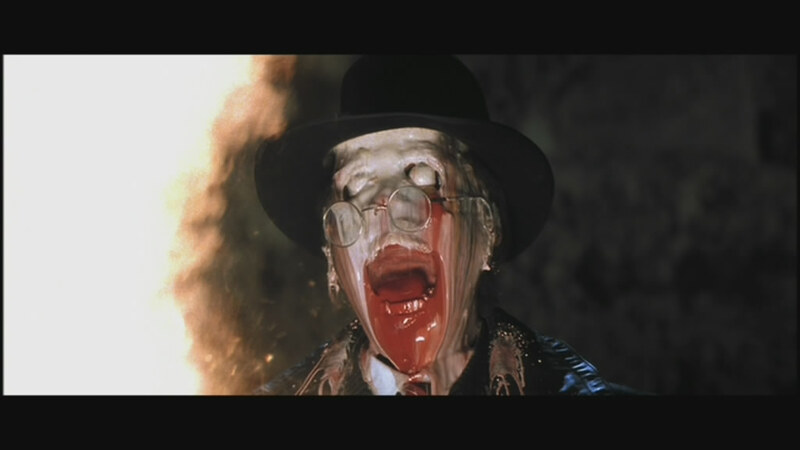 Raiders of The Lost Ark would be nothing without it’s spectacular, death-defying feats of stunt work. The setpieces for the film are still great to watch today, decades after the film was made. 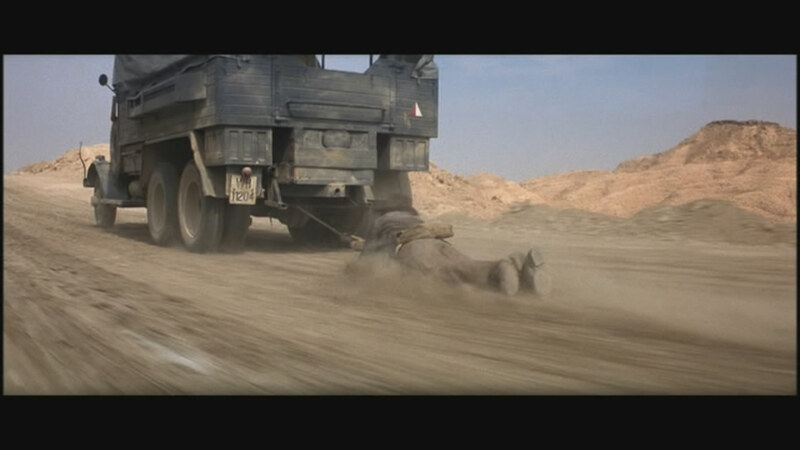 An exciting truck/car chase through the desert sands, with Indy being thrown over the bonnet, sliding underneath the truck, being dragged along behind, and then clambering up the back again, among the film’s most iconic scenes. There’s a scene inside the Well Of Souls, the resting place for the Ark, which is filled with snakes (Why did it have to be snakes?) that gradually encroach upon our hero as his flaming torches slowly dwindle and die. The massive plane fight, with Indy and a huge Nazi thug duking it out around a slowly turning aircraft (propeller blades and all) while Marion becomes stuck inside the cockpit. There’s the city chase through the streets, with Marion in a reed basket being kidnapped by the Nazi’s, pursued by Indy, before being blown to smithereens in a fireball of dynamite and gunpowder. 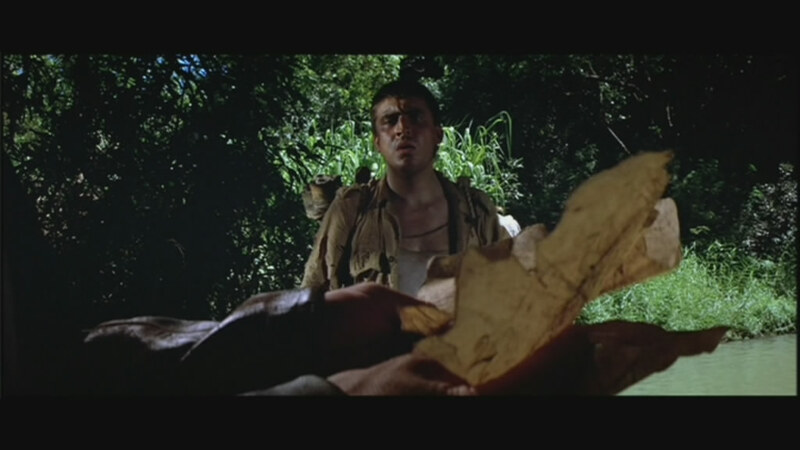 And who could forget the equally iconic moment when Indy turns to see the advancing boulder threatening to squash him inside the caves of the Peruvian jungle, before turning and sprinting to escape? 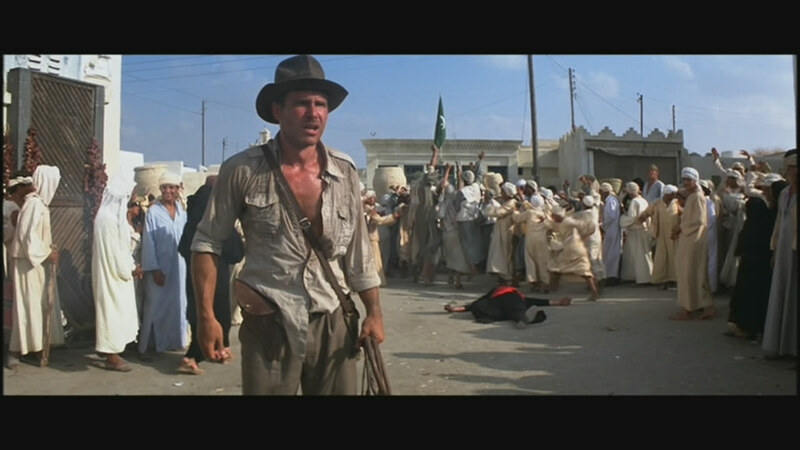 Indy locating the Well Of Souls. The film has charm and action to spare, such is the breathlessness with which Spielberg directs it all. The action never seems forced or belaboured, the editing is sublimely restrained and the massive master shots Spielberg utilises are indicative of his prowess as a film-maker. He’s not afraid to simply let a scene work in a master shot, without cutting to insert shots all the time. This technique has stood him in good stead throughout his career, and in AI he made full use of it while imitating Stanley Kubrick. In one of cinema’s defining moments, one of the great theme tracks of all time was written by master composer John Williams, the Raiders March, a trumpet and percussion-filled beast that is now often used to signify something heroic in countless YouTube videos and home movies. 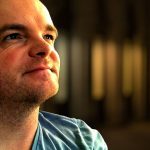 The opening refrain, with the simple quartet of notes stating the main theme, is gloriously simple, and when the orchestra kicks in to fully complement the image on screen, the hairs on the back of your neck will stand on end…. it’s that powerful. John Williams scores for Raiders, as well as Last Crusade, are among his best work, I feel, and I don’t think he’s done better (until Return of The Jedi, which I rank as my favourite Williams score). The music score to Raiders is sublime. Filming this movie was such a drag. I know, we didn’t think it was funny either. There’s such a sense of fun with this film, that engages the audience and draws you into the story: is Indy a grave robber by stealing (read: reclaiming) these lost artefacts? Is he justified in his actions, even if it is 1930’s and all bets are off at this point? While never really touched upon in the script, written by Lawrence Kasdan (who himself directed one of the finest westerns ever made in Wyatt Earp), Raiders has enough going for it to overlook and logical, and illegal, points. After all, it’s a film where a man is chased down a tunnel by a large boulder. Wrath of God 1, Bad Guy 0. Almost everything about this film is perfect. A combination of casting, story and effects, action and music, have made Raiders almost unassailable in critical circles ever since. If you had to list a couple of film’s that you could watch over and again on a deserted island, I’d have to say that Raiders would be in my top ten somewhere. Fun, exciting cinematic pulp material is given a fresh leash on life due to the skill of a master storyteller in Spielberg, and if you don’t find yourself watching this with a smile on your face, then I dare say you need to check your pulse. Cinema for the sake of entertainment, that really does entertain. I agree. I love Raiders. It's one of the best films ever made, IMO!! !